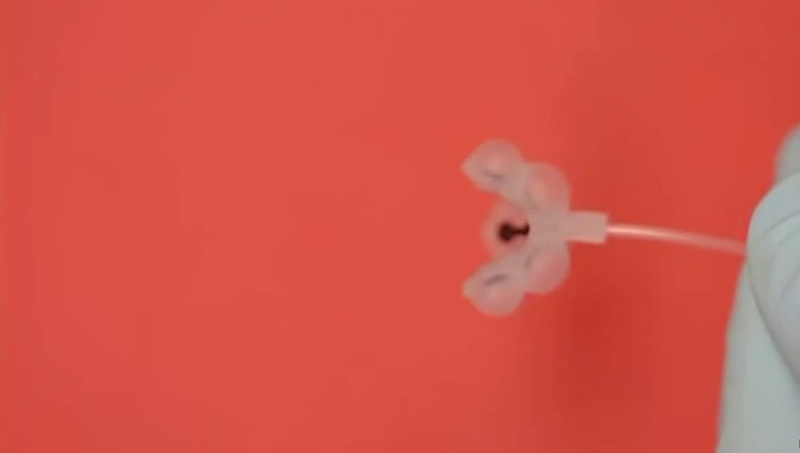 By helping rubber and plastic stick together under pressure, University of Nebraska-Lincoln chemists have simplified the production of small fluid-carrying channels that can drive movement in soft robotics and enable chemical analyses on microscopic scales. The technique, which creates a stronger chemical bond between silicone and an unprecedented array of plastics, could greatly reduce the time, complexity and expense needed to produce and customize the microfluidic devices. "We're really excited, because we're providing a (technique) to successfully integrate different materials in a way that is streamlined and supports numerous practical applications," said Stephen Morin, assistant professor of chemistry. "We think that can really offer new opportunities to the community." In demonstrating those opportunities, the team used a basic software program to design microfluidic networks and a standard laser printer to map those channels onto a transparent Mylar sheet. After exposing the plastic sheet to ultraviolet light and submerging it in a solution, the researchers laid the sheet atop a silicone film and applied heat. The plastic and silicone bonded strongly—except where pathways had been marked by the printer's ink. When the team pumped air or liquid into those unbound sites, the fluids flowed through them at rates dictated by the pressure being applied—pressures several times higher than what previous bonding techniques have withstood. Microfluidic networks can accommodate the flow and mixture of multiple liquids, essentially acting as a microscopic lab for analytical chemistry techniques that otherwise require conventional equipment such as beakers. Airflow through microfluidic channels can also direct the motion of soft-robotic arms, grippers and other components that show promise for remote surgery, space exploration and food processing. "The analogy I use is: Would you rather have some sort of a soft gripper performing surgery on you, or would you rather have the Terminator do that," Morin said. "When the Terminator does it, if something goes wrong in the control-feedback loop, you have a big problem. But when you have the soft-robotic gripper doing that, if there's a problem, it just deflates like a balloon that's failed." Manufacturers typically create microfluidic patterns by projecting light through customized masks onto a chemical-treated surface and then replicating that pattern into rubber, ultimately molding channels before overlaying them with plastic or glass. But many researchers must send their designs to specialized production facilities, often waiting a week or two for a mask to arrive. Modifying a design, even slightly, can mean another weeklong wait. By contrast, the Nebraska team needed just an hour to produce a plastic-silicone segment featuring microfluidic networks. And unlike a more traditional method for bonding silicone to plastic, the team's technique allowed it to incorporate a large range of commodity plastics—inexpensive, easily accessible varieties that previously resisted bonding with silicone. 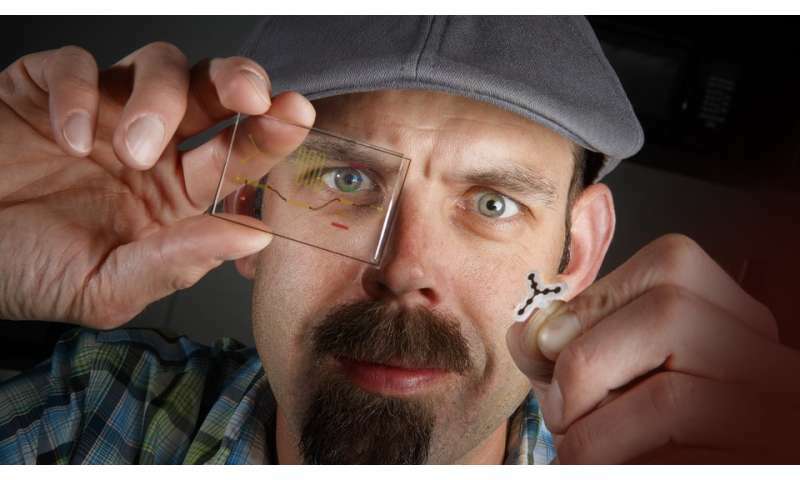 "People who had done anything like this before had relied on low pressures and open-channel designs, so they really weren't advancing the fabrication process of what you see in traditional microfluidics. Here, the chemistry has been worked out in a way that … we can access these applications directly—print microfluidic devices, print soft-robotic devices." Morin and his colleagues also demonstrated other advantages made possible by their bonding technique. The team showed that creasing a Mylar sheet before melding it with silicone can adjust the movement of resulting soft-robotic arms and grippers. Folding it several times at a 90-degree angle, for instance, made an arm curl more tightly. Creasing it at a 45-degree angle caused the arm to twist left or right, depending on which direction the researchers folded it. That level of on-the-fly versatility far exceeds what is offered by existing approaches, Morin said. Because ink can prevent silicone and plastic from bonding, the team also modified an already-printed sheet—adding microfluidic channels to an existing design—simply by drawing on it with a marker. That capability, combined with the relative ease of production, could make the technique appealing to educators and science-oriented outreach groups, Morin said. "We looked at it as an interesting opportunity to even further streamline the process, where you have some sort of a template that you could perhaps mail to different educational groups or workshops," he said. "And since you really only need an oven and a (UV) light source, you could potentially enable these groups to explore this kind of a technology, where they're literally customizing it by using a Sharpie." The team detailed its work in the journal Advanced Materials.